the Left (coast). I’ve been in New York for about four years this time around and another four or so in another life back in the early ’90s. I love it here and can’t imagine living anywhere else. But man, do I love going home. I’ve had a horrible case of San Diego-itis the past couple of months and finally was able to carve out some time to get home before I start my new job (which I will talk about later–big news!). I spent a glorious two weeks with my family going to the beach, drinking beer and catching up with friends, hanging out with my dog, Ron and of course lots of knitting. 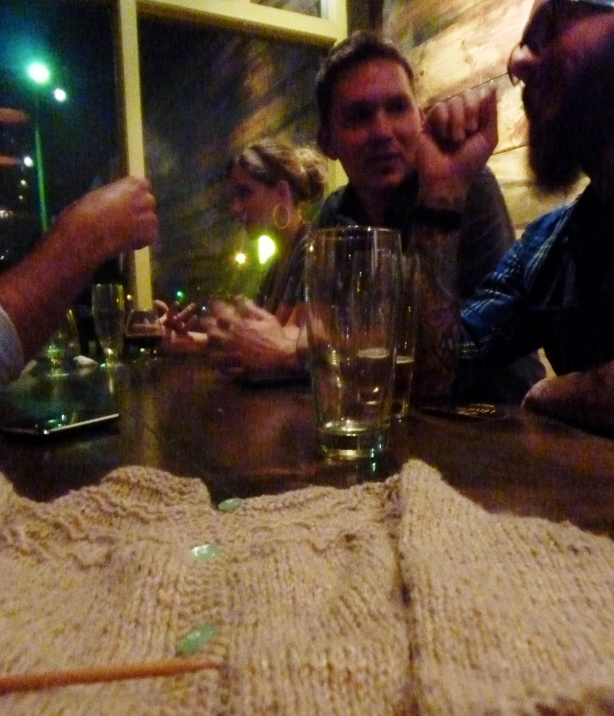 Knitting and drinking beer with friends. Ahh. My favorite thing. 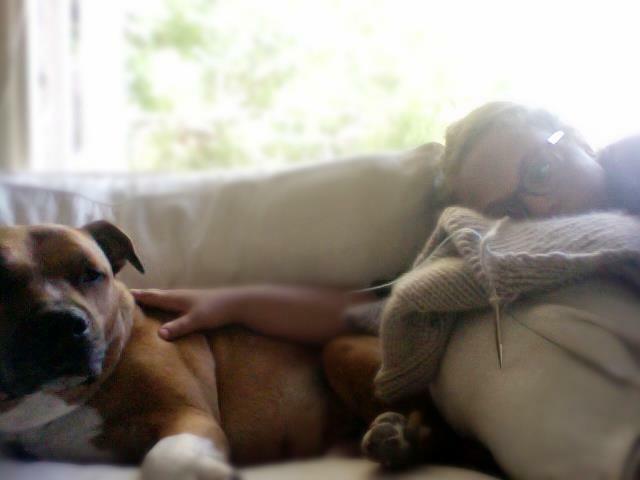 Knitting with my dog, Ron. The knitting started right out of the gate–literally. I agonized for days over what to pack for plane knitting. It really is a challenge to pack for a knitter. Go ahead and laugh, but the whole ordeal caused me a great deal of stress. I had to check a sweater I’m working on that is just a collar away from being finished. Do you know what that feels like? I mean, you may as well just throw your kid under the plane and hope for the best. Your beautiful, labor intensive, merino wool kid. And then there is of course the carry-on knitting*. Ok, how can I explain this? I think one of the things I hear most often as a knitter is “I would love to knit, but I just don’t have time”. I hate this as it always sounds so condescending and implies that I have nothing but leisure time to futz around with my little crafty indulgence (which has been kind of true this summer, but that’s beside the point). Well, here you go. 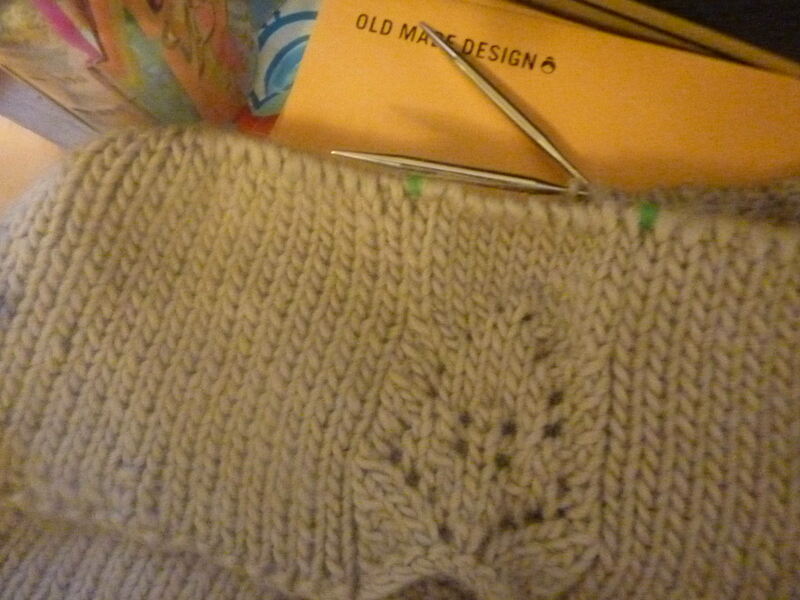 Five plus hours handed to you on silver tray table of uninterrupted knitting time. 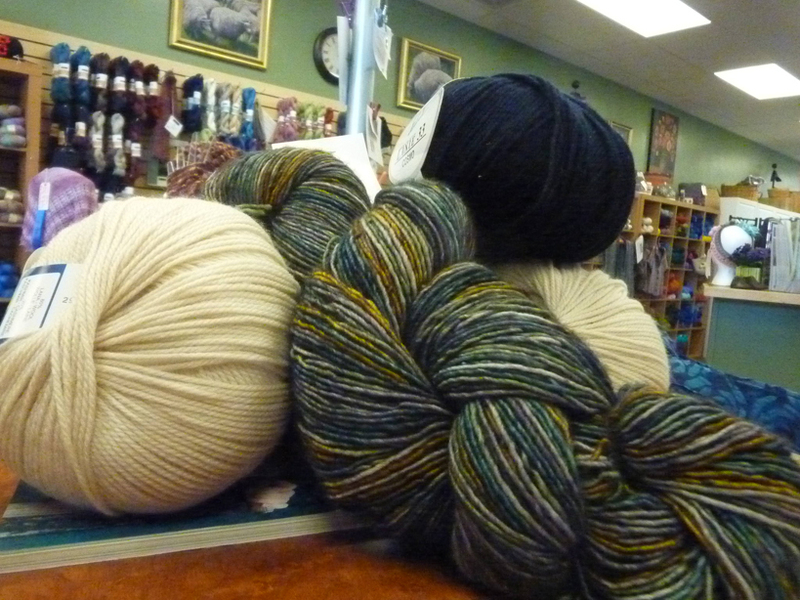 A cross county flight is a gift to a knitter. And my flight to San diego was the best present ever. 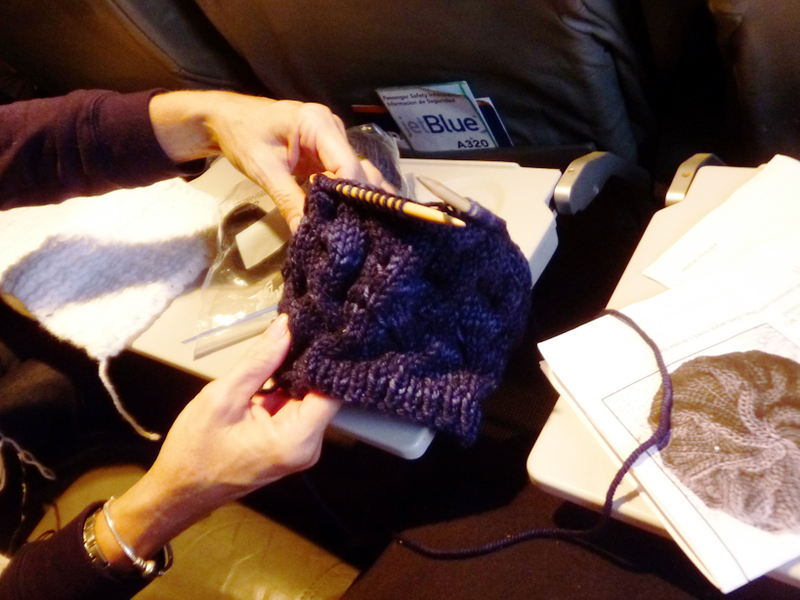 Knitting on the flight with my crocheting seat mate. I had a beautiful cake of Tosh Chunky (I’m becoming a Madelinetosh junky) in the Ink colorway that I picked up at Knitty City. It’s gorgeous yarn and looks like denim. I settled on the Star Crossed beret as my project (with an unfinished sock as back-up) and it proved to be great airplane knitting. In the round, small circular needles and just a simple cable to keep things lively. It was fast and fun. As soon as I was settled, I took it out of my bag to cast-on and glanced over to find my seat mate reaching for her crochet hook! It happened just as it does when you see another knitter on the subway. A little nod and smile (someone on Ravelry suggested we come up with a gang sign we could flash). We went back to work on our projects and waited for the dreaded middle seat occupant, who, never showed. It was great. We had an empty middle seat for our yarn, full range of motion, stretched out and thus began our own little mile high club of sorts. We talked about yarn shops and patterns, stuff to do in San Diego and as is usually the case with yarn people, the conversation shifted a level beyond small talk to tradition and family. Once again, craft opens the door to world with some depth that is far more interesting than it would have been if you hadn’t had that yarn in your hand. It was a great flight and the time just flew by. I had the hat all but finished by the time we landed. You know what that means–more yarn! 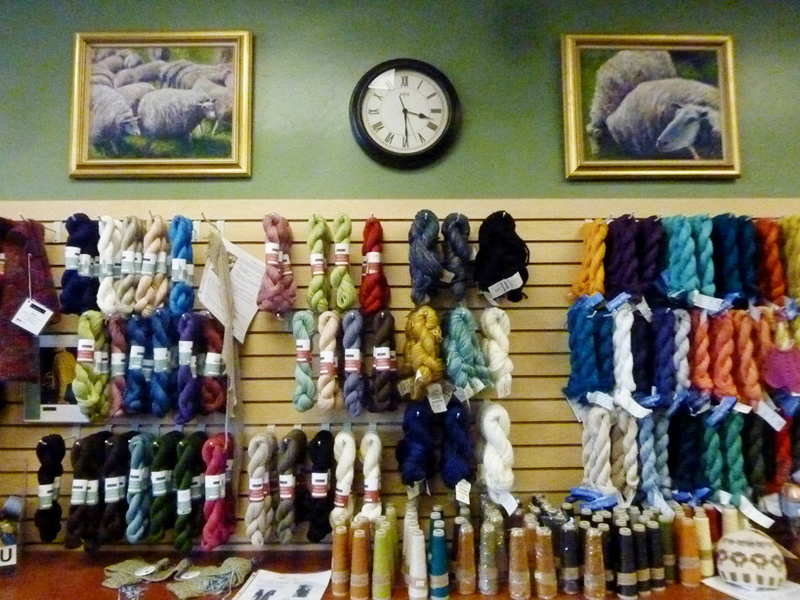 No trip anywhere is complete without a visit to the local yarn store. I jumped in my mom’s Prius (I really miss driving), cranked the NPR and headed out to La Mesa to Two Sisters and Ewe, a shop enjoying it’s new home in a much bigger location. I hadn’t been there before, but I knew as soon as I pulled off the freeway it was gonna be a good one. 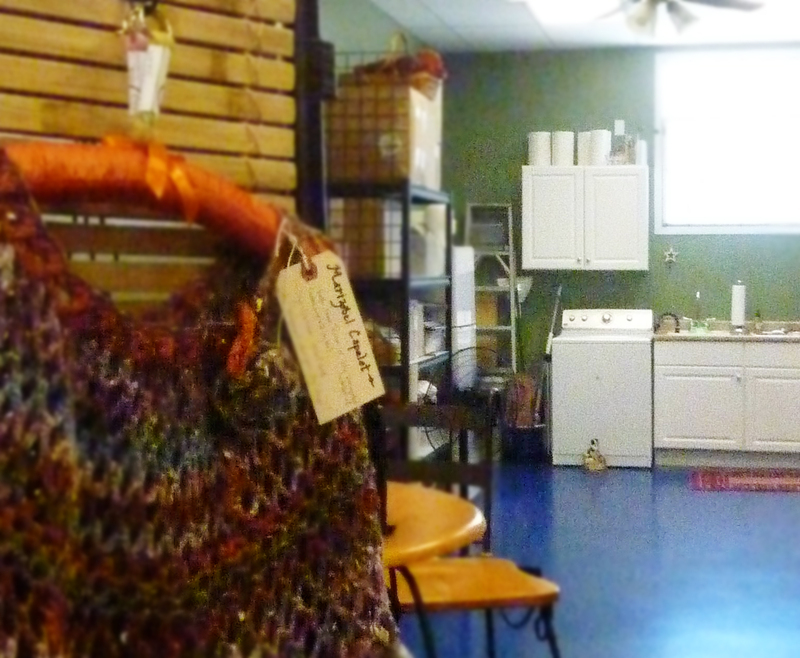 It may sound counterintuitive, but yarn shops that are sort of isolated and lacking in curb appeal tend to be really good. Webs in Northampton, MA which is sort of knitting mecca is like this, School Products here in Manhattan is too, and so is Two Sisters. I never would have thought this as a novice knitter and would have probably avoided these stores in favor of a shop housed in a cute little cottage or cool urban studio which, frankly can be hit or miss. 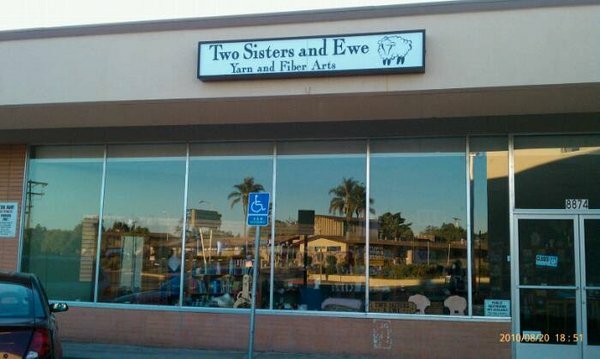 Now I get excited when I see a shop like Two Sisters cause I know it’s a destination and must have something special to make it one. It’s in a sort of old-school strip mall and used to be a giant reptile store (Ack!) and, like Webs is neighbors with a bead shop. There is an appeal to shops like this. They make you feel like an insider. I almost wish they required a secret knock or something. Yes, I think we do need a knitting gang sign! I love this store and once your inside you see the benefits of a space like this. Forget curb appeal–this store has space (and plenty of charm)! 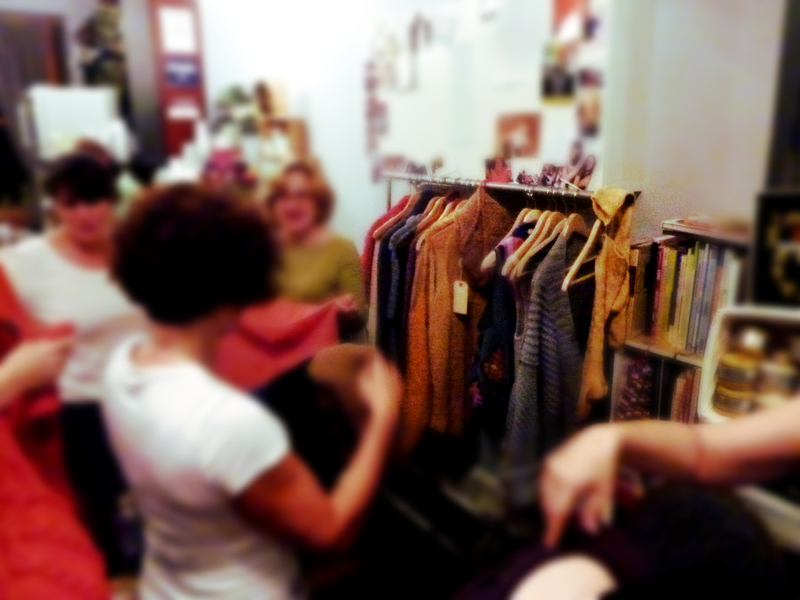 Lots of samples knit up around the shop. I love that. Plenty of room to house a big selection and really showcase the yarn. Comfy places to sit and knit and even a washing machine for felting wool. My treasures from Two Sisters And Ewe–Tosh Merino Light in Plaid Blanket and a few balls of Lana Gatto merino/cashmere. Love. I wandered around dithering over what to choose for a good hour at least. And was indulged with really great (and patient) customer service from Karen which always makes buying yarn feel special. I’ve cast on for a stripe study and will always think of home when I wear it. So glad I had a chance to visit the shop. 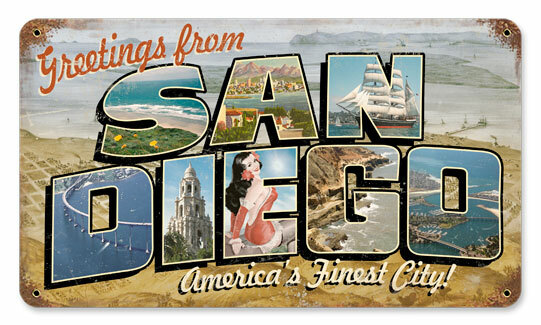 It was great to be in San Diego. Only after being away so long do I really appreciate how beautiful it is. And no matter how old I am, it’s always nice to be home. I got to celebrate some special birthdays, relax at the beach, eat mexican food, spend some QT with family and just curl up on the couch with my dog and my knitting. I heart San Diego and it’s always nice to come home to NYC. Until next time, you stay classy San Diego. Learning to Knit from Max Alexander on Vimeo. earlier and you can feel the change of season start to creep in. It’s subtle, but it’s there. I can feel it. I know there are people who don’t like making cold weather gear in the summer, but I don’t know, I just love it. I think every sweater I’ve made was cast on during the summer. I was knitting with a friend a few days ago and we both had Fall projects on the needles. 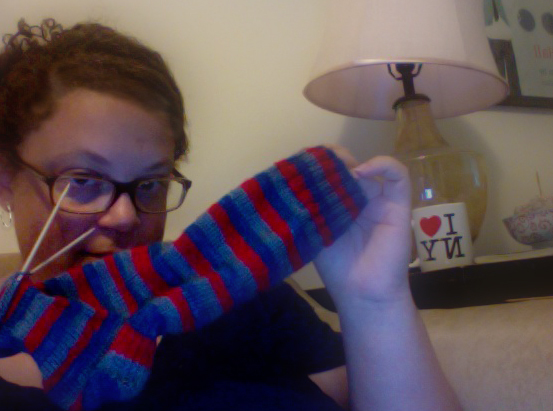 As we knit away, a dueling pattern comparison rally broke out, “Have you seen the…I think I want to make it. What about this?” “Ya, I saw that. Cute, I’m gonna make this!”… Eventually we ended up hopping on Ravelry to go through our queues, make some real decisions. 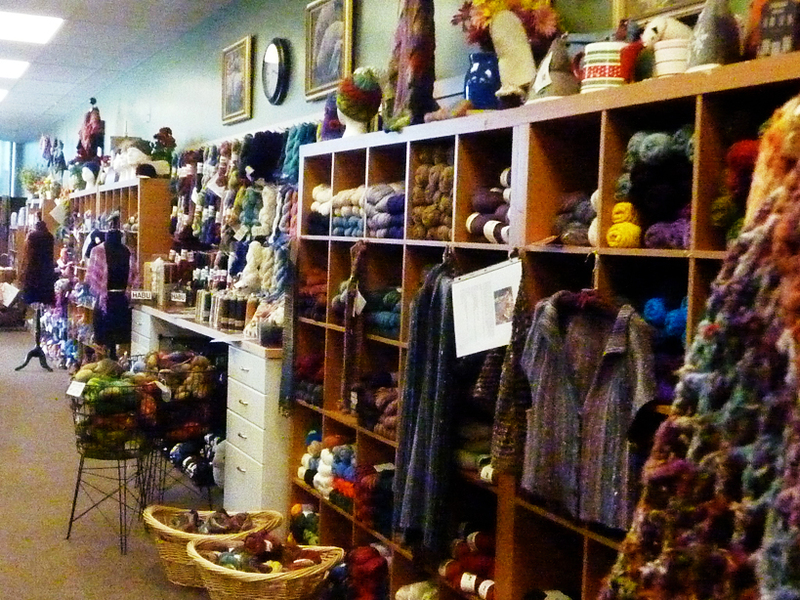 We narrowed down our long lists to the best of the best and fantasized about yarn and field trips to knitting shops and Rhinebeck. And I’m am not joking–we were positively GIDDY. At one point I think I was jumping up and down and clapping. It was so much fun. I felt pretty giddy when I first saw this Fall/Winter collection. Last week I knit my way down to Brooklyn on the F train to the Vogue Knitting trunk show at La Casita, a cute little LYS on Smith Street. Flipping through the upcoming Early Fall issue, we sipped lambrusco and talked of knee socks, caplets and color. It was so fun to see all the samples in person. I love to see how the pieces translate from the high fashion styling to real life. I think Fall knitting is all about fantasy– on and off the page. Hooray Fall! I am SO ready to wear my cold weather knits! Summer isn’t so bad. 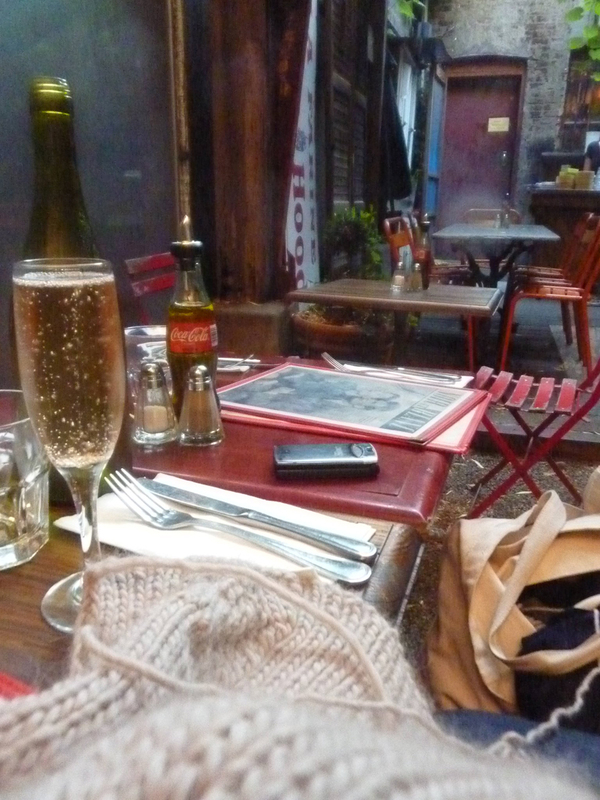 Enjoying some next-seasonal knitting in the garden of Robin Des Bois in Cobble Hill–just a quick walk fromLa Casita! Me: Here you go, crazy cat lady (shares links to some knitting patterns). I knit some. So cute. Angry Sandi: What the F? Angry Sandi: That is just stupid. Even as crazy as I am I can see that ain’t right. Bobby pin cozies? GIVE ME A BREAK! Me: You make me sick. 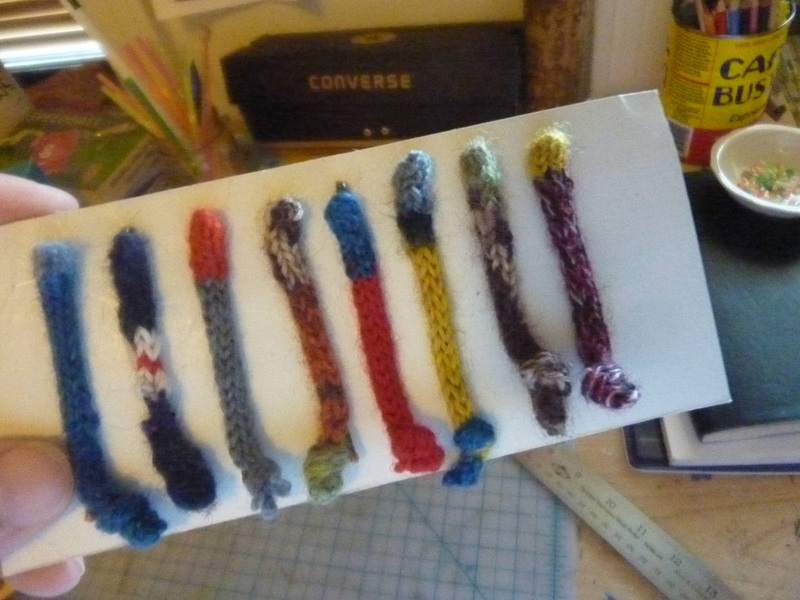 Bobby pin cozies are adorable. You’ll see. or self-patterning sock yarn are great for these. Any scraps really. Shortly after our conversation, Angry Sandi came to visit and realized she was indeed mistaken. 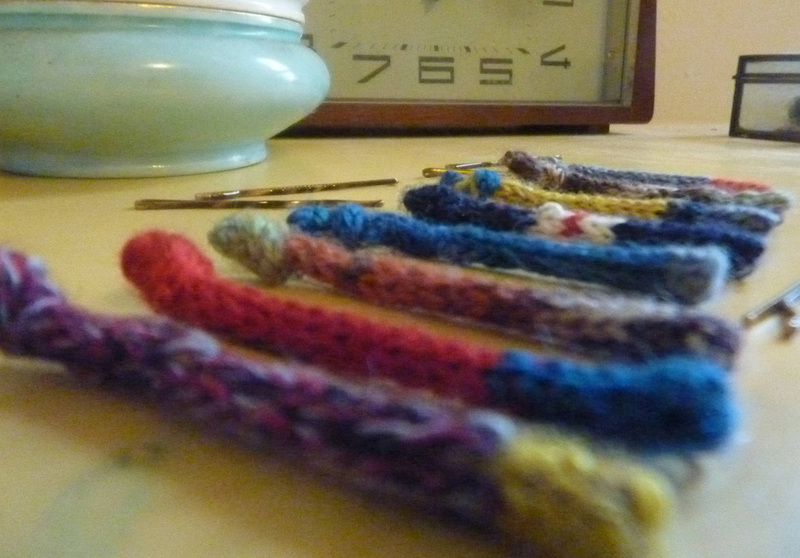 She made a beeline for Knitty City and whipped up a few for herself making Angry Sandi, very happy. Bobby Pin Cozies are adorable. bang for your buck. Be warned though, they are really addicting to make. Picking color combinations is a game of endless satisfaction–a little rush as you admire each finished pin. I always want the recipient to feel that rush when they have been gifted a hand knit. It rarely happens that way. Let’s be real, it’s much easier for the average person (non-knitter) to tell how much you love them when you hand them a little blue box. Things bought in a store generally have the benefit of some sort of name recognition and can trick the recipient into thinking the gift is unique–something they couldn’t walk in and buy themselves. A little sparkle of excitement and “aw, you shouldn’t have” tilt of the head before they even open it. All this is really just to say– in the presentation–a hand knit can sometimes look a little sad. I felt like this with bobby pins for M. I threw them in box I found in my closet that was too big and they rattled around in there looking pathetic and lonely. I knew if I stuffed it with tissue paper she’d be fishing around looking for the “real gift” and nobody wants that. Awwwwkwaaaard. No, there has to be a better way. 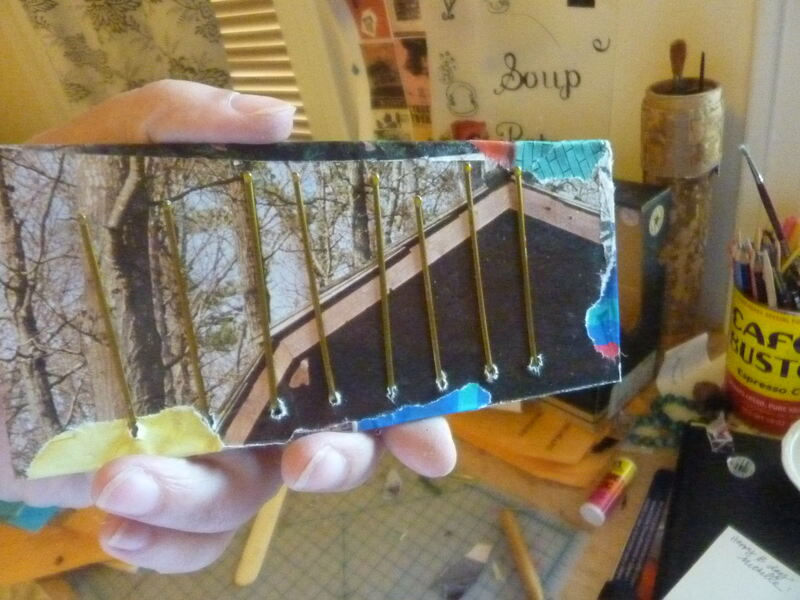 So, I busted out the box of book binding supplies, cut a scrap of cardboard and punched some holes with the awl to kind of package them like regular bobby pins. They looked so much more cheerful. But M is kind of a free spirit and as much as I like them on the white, I couldn’t stop. I wanted it to feel more like her. The obvious answer–collage! 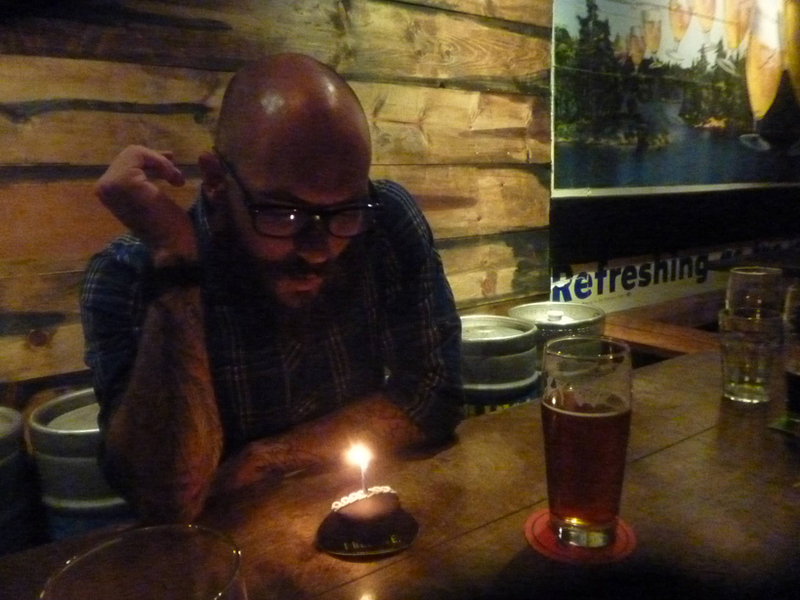 We once had s’mores together at this summer camp themed bar in Brooklyn, Camp. This fun memory was stuck in my head and I went to town on the Urban Outfitters catalog. 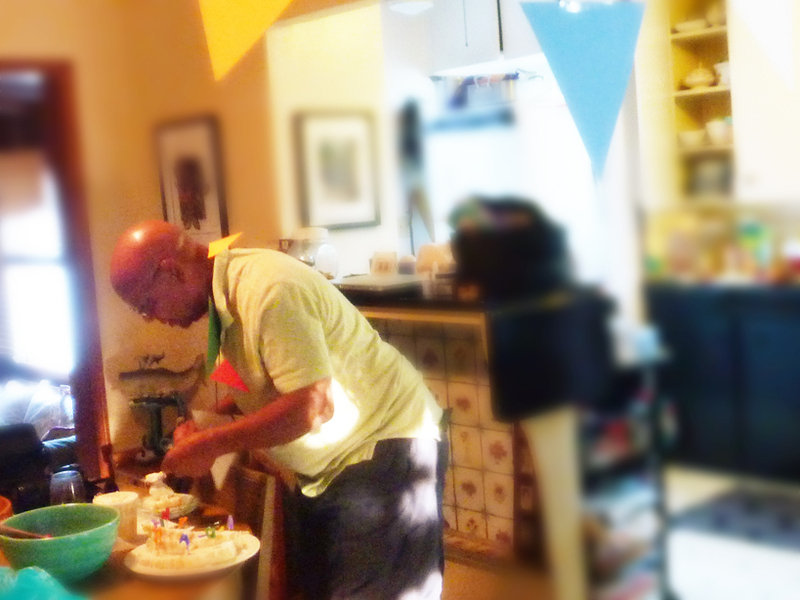 Feverishly ripping and glueing, before running out the door to meet for dinner. 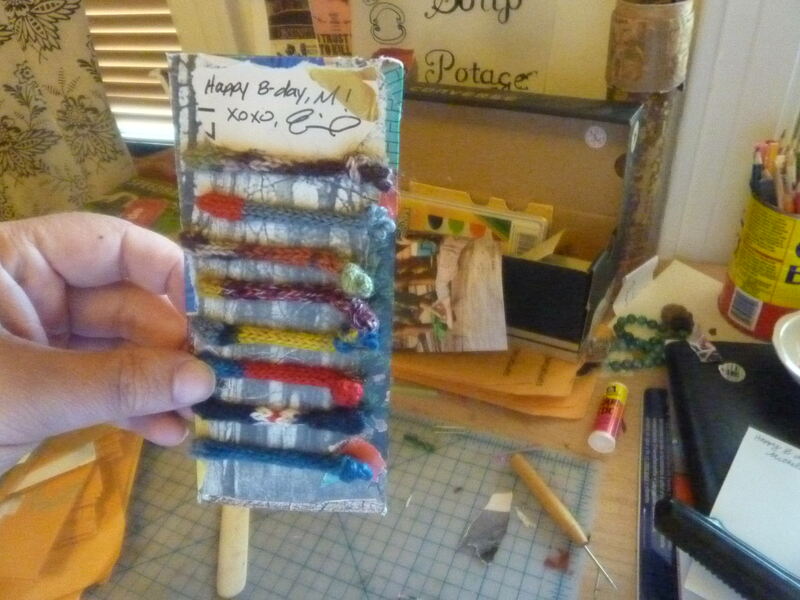 I ended up with “Michelle’s Custom Bobby Pin Sweater Card”. She loved it. Just a little extra effort made this little something feel extra special. “Awww, you shouldn’t have”. 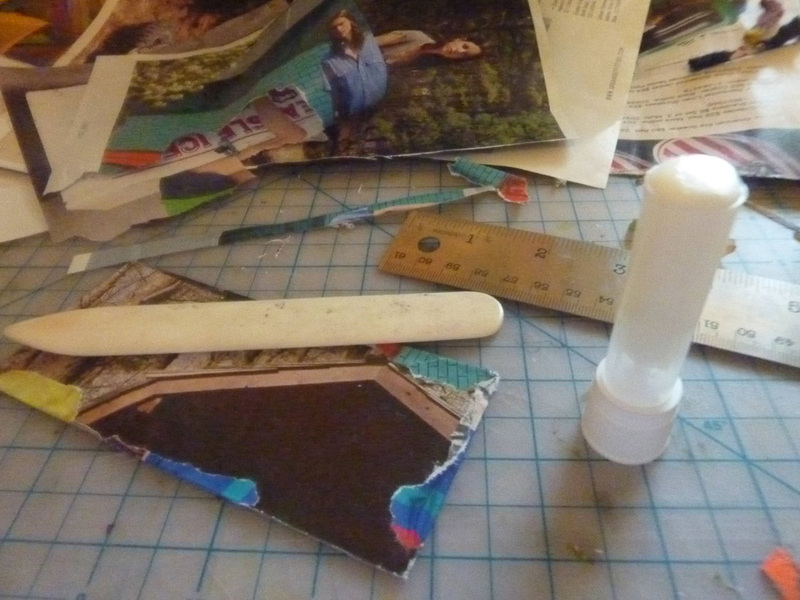 Fun with junk mail from Yellow Owl Workshop. Walk around with a screw loose long enough and eventually you’re gonna snap. So what of Thomas Jefferson’s good advice? I blatantly ignored it in favor of Garfield The Cat (“Never put off the work till tomorrow what you can put off today”). Yeah, I knew it was coming and I did nothing to prevent it. And now I have to try and MacGyver them to stay on my face and hope they can be fixed. I look like an idiot. Dumb. Glasses held together by a paper clip is pushing me closer to old maid than Old Made and it’s teetering on the edge of Grey Gardens (Oh Eeeedie!). I gotta get it together so I can stay in the game. Hopefully my frames can be repaired but either way, I’m gonna need new glasses. I am going to be proactive. 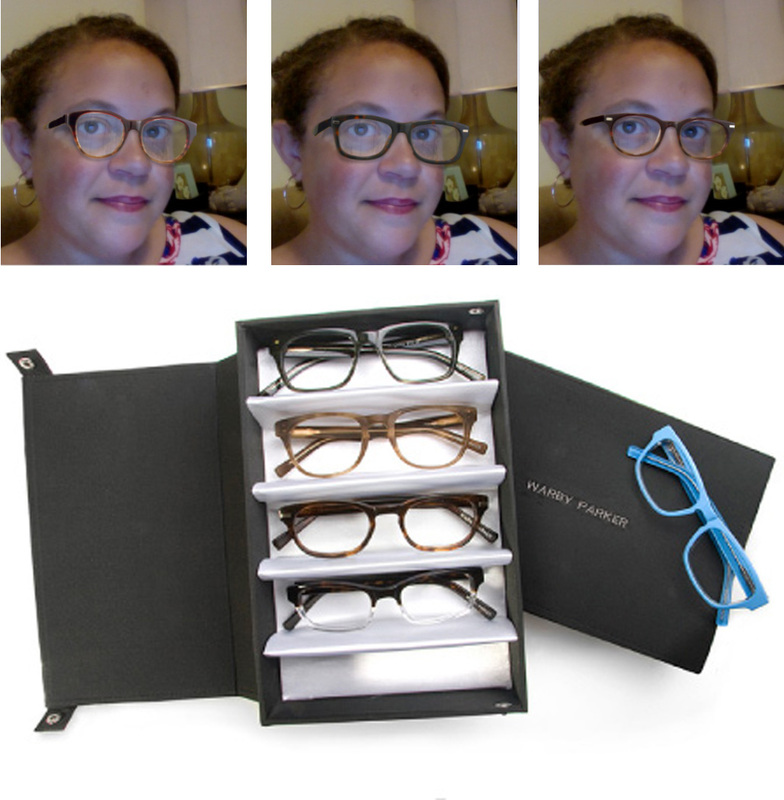 A while back I mentioned Lisa Loeb’s Eyewear line and really was hoping to try a pair. But, unbelievably I can’t seem to find them in NYC. Because I have to wear my glasses every day I am reluctant to purchase online without trying them on. That’s too blind of a commitment for me. Have you heard of Warby Parker? I saw a feature on them a while back. A couple of cute, socially conscious, glasses wearing boys started this company that is really quite something. I won’t go into it here (learn more here), but I’m pretty positive I will be buying from them. And here’s why. Warby Parkers“virtual try on”. From what I can tell, I kind of love these. As soon as I get the actual frames in the mail I’ll post pics. Curious to see how accurate this is. Man, I really hope my glasses will hold together until I can order a pair of these. You were right, Jefferson. It was a mistake to wait so long. Now I may be up a creek and am totally kicking myself for my carelessness. 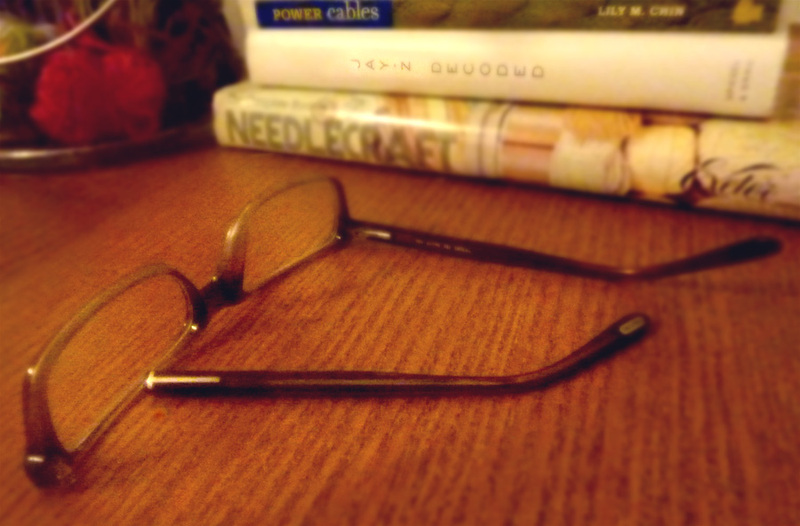 I will move fixing glasses to the top of my list of stuff I shoulda taken care of (and tackle the rest tomorrow?). It’s been a shite week and really, the only refuge is knitting. And even that has the potential to make me sick. 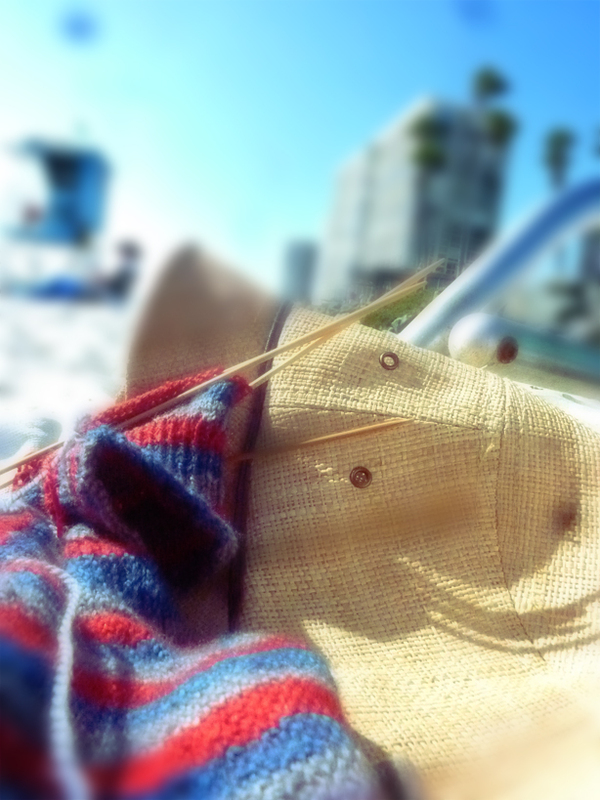 A lap full of hot wool in 100 degree weather, dropped stitches, broken sock needles–Awww, HELLLL NO! Yep. I got 99 problems BUT, a stitch ain’t one. Listen, it’s rough comin’ up on the streets of Queens (yes, even FoHi). Especially if you’re a knitter with Malabrigo taste, a Red Heart budget, no job and broken glasses. Sometimes you gotta hustle a little to stay in the game. I don’t remember where I first saw this idea, but it’s a good little trick to improve your flow and catch/prevent any major flubs before they become a big pain (like having broken glasses-ugh I’m so mad). Like EZ says, “Properly practiced, knitting soothes the troubled spirit, and it doesn’t hurt the untroubled spirit either”. Check it. stitch markers. Pattern is Coveside by Cecily Glowik MacDonald. My favorite straws to use are the big green ones from Starbucks, especially if you’re using a fairly large needle. 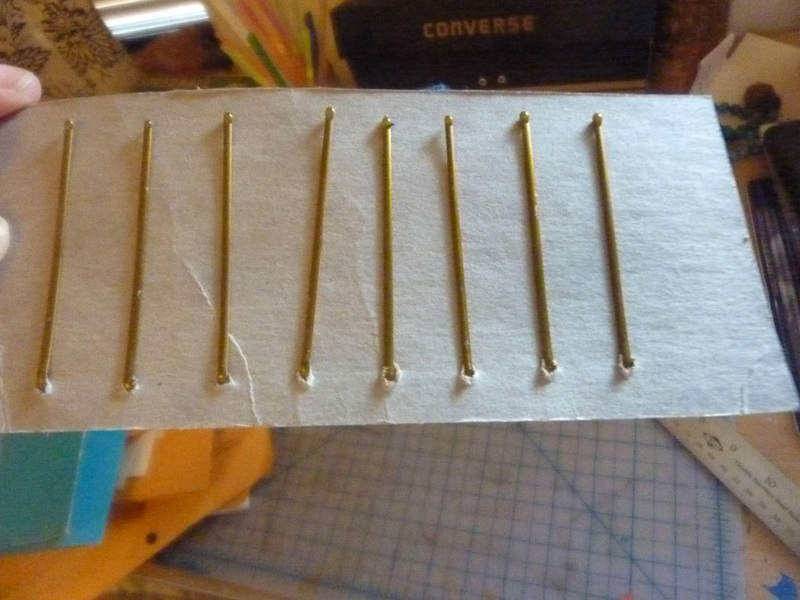 I have a few from a grande iced americano to mark an eyelet panel in a vest I’m making on US size 10 needles (above). The green is a great contrasting color making them easy to see and that much harder to overlook. 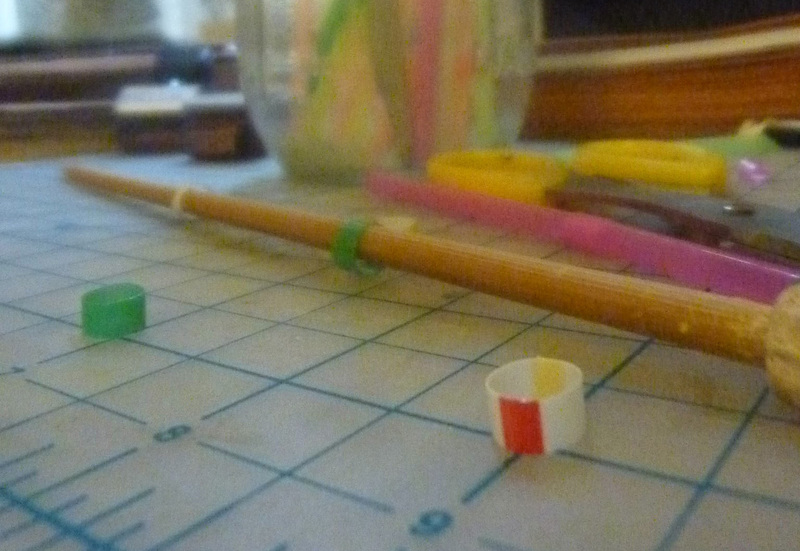 I am constantly losing markers and have taken to using straws pretty much exclusively. I just trim a few rings off as needed like clipping herbs from a garden. Find a size that is close-ish to your needle size. It’s surprising how many different kinds of straws there are. Once you are aware it, you can score just about any size you need. 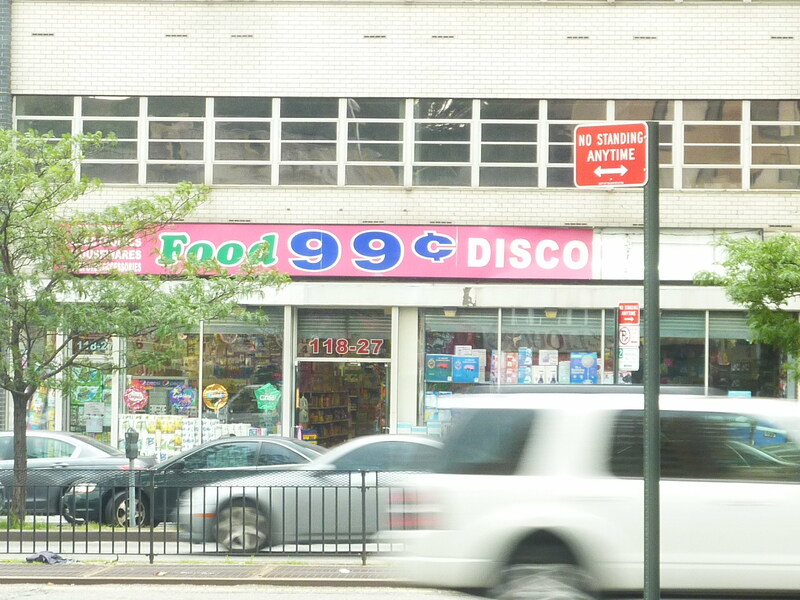 The 99¢ store is a good place to look too if you’re not gansta enough to swipe an extra straw or two with you frappucino. You can usually get a big box with lots of colors. 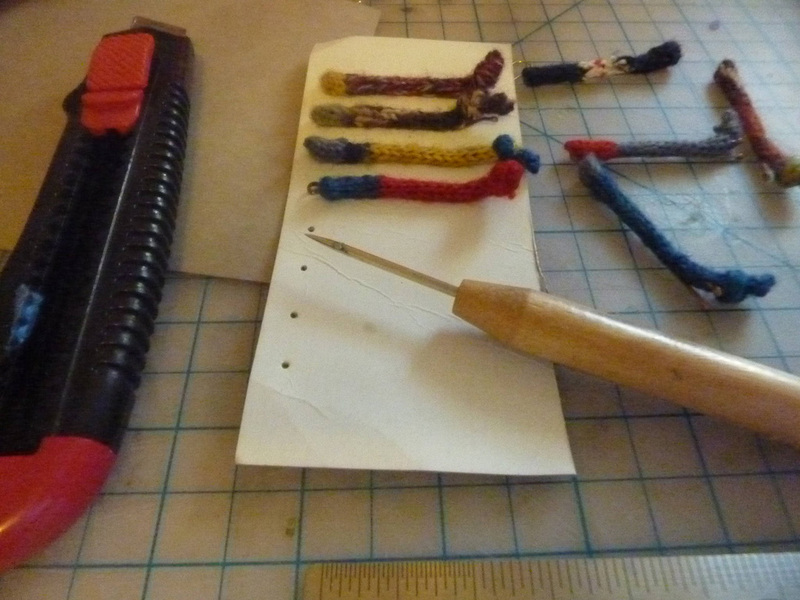 I think I’ll make some more now to keep in my notions bag so I am prepared when the time comes. Another life lesson learned through knitting. Word. WARNING explicit lyrics. Seriously Emily, a warning? Crisis averted. Glasses we’re repaired, free of charge by my friendly neighborhood optical shop, Station Square Eyes on 71st Continental, just off Queens Blvd. All’s well that ends well. I drink coffee every morning. I try to buy decent coffee when I can (I love the beans from 9th Street Espresso). I make that good coffee in my old, stained, l don’t know how else to say it but, ghetto Mr. Coffee 12 cup basket maker (it doesn’t even have a timer, poor Emily). I also have a flip phone that looked dated when it was new that I’m teased mercilessly about. I’ve had the same digital alarm clock radio for at least 15 years. I don’t keep these things cause they are cool. They aren’t old enough to be retro or ironic, they just look dumb. Oh god, and my headphones! I have a relatively new ipod (who buys a new ipod instead of just getting a iphone?) and I wander around New York City with some raggedy old headphones from Duane Reade that don’t have very good sound but are “comfortable”. Hand knit, hand wash socks. So wrong it’s right. I’ll wear them till they have holes and stitch them right back up. Do you even care about your socks? This is ridiculous. A while back a wee tragedy struck my FoHi apartment. 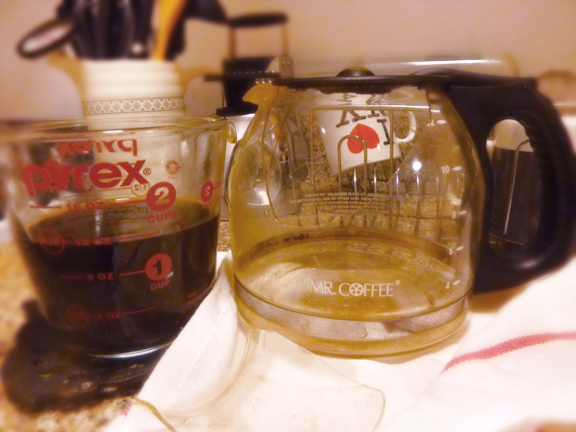 I broke my coffee pot. Well, I didn’t “break” it. I cracked it in a nice wedge that traveled from the pouring notch, south to about the 8 cup fill line and back up to the rim. I think I stared at it for like 30 seconds trying to figure out if what I was seeing was real. It was. I guess I should have, well I know I should have, thrown it out. But I didn’t. I was desperate for coffee and decided to just make-do. It’s been well over a month and I’ve still been using it filling no higher than the 6 cup line and pouring from the other side. It’s comical really. Why on earth did I not just go buy a new carafe for it? Because it still (sort of ) works? I first saw Secret Holiday at the Renegade Craft Fair in Brooklyn. The Make-do & Mend banner has stuck with me ever sense. I don’t usually love things with phrases on them (if I see one more “keep calm” variation…). But these big block letters are perfectly un-perfect(?) and they actually mean something to me. I guess that’s the difference. It’s sincere, it’s modern, it’s old and I love it. And the Hold Your Horses tote? Pretty much a battle cry for NYC. I’m kicking myself for not buying it. So good. I’m adding both to my wish list.